New poll shows Israelis far more likely to trust doctors at their local clinic than hospital staff. Israelis trust their health clinic's doctors more than they trust hospital doctors, a new poll found. The new poll was conducted by the National Institute for Medical Research, and investigated the public's opinion on Israeli health care services. Only 40% of the Israeli public said they place a "lot of trust" in the public health care system. 61% of respondents said they trust their health fund's clinics and family doctors, and 39% said they place "a lot of trust" in Israel's hospitals. 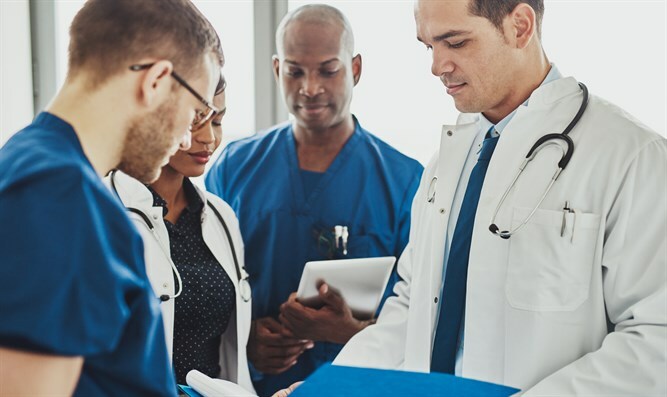 "There are significant gaps between how the public sees their family doctors and how they see hospital staff," Gertner Institute researcher Dr. Giora Kaplan, who conducted the poll, said. "The public expects to receive excellent care from their family doctor if they need him, but expects to receive worse treatment from the hospital if they end up hospitalized. "In addition, those interviewed said explicitly that they trust their health fund's clinic more than they trust the hospitals. "The public also criticized Israeli doctors. Most of them don't agree with sentences such as, 'The doctor always knows best what my health situation is,' and 'The doctor's decision is always based on what he believes the best treatment options for me are, and not on the health fund's or drug manufacturer's financial situation.'" The poll also showed most Israelis believe their health fund's doctors will invest more time in them than hospital doctors will. They also believe health fund's doctors will be more patient and take more time to explain the problem and possible solutions than hospital staff will. Some of the respondents believe health fund doctors are more respectful and polite than hospital doctors. Approximately half of the respondents trust their doctors and believe their doctor best understands their health and needs. 60% of respondents said they trust the doctors to decide on the best medical treatment is for their patients. 42% of respondents said the only thing their doctors cared about was the patient's best interests, but most of the public believes doctors take financial factors into account as well. "It seems the Israeli public has internalized the newer attitudes towards health care, at least in theory," Kaplan said. "Most of the public thinks they know better than the doctor what their medical situation is. They are not willing to accept a treatment protocol until they understand the reasons behind it. Patients want to decide for themselves what the best treatment plan is, and they want to be active participants in the process." 35% of Israelis said they believe they will receive the treatment they need via the public health care system, 45% are not sure, and 18.5% do not believe they will receive the necessary treatment. "This poll shows the lack of faith Israelis have in the health care system, the education system, and the legal system. This poll shows the Israeli public's doubts regarding whether or not the public system can adequately provide for their needs," Kaplan said. Despite the low scores, the public health system did relatively well when compared to other public systems. The defense system enjoyed the most public faith, at 63.2%, the health system came next with 39.5%, the legal system received a score of 34.5%, the education system received 30.5%, and the National Insurance Institute received 21.5%.